Two ministries at First Baptist Church of Plant City are helping singles connect through faith. Pastor Daniel Helms has two goals for First Baptist Church of Plant City’s Young Professionals and Single Adults ministries. The first, he said, is for ministry members to grow and mature in their relationship with the Lord. “We want to point people to the church,” Helms said. The second is to connect ministry members with each other in both friendships and romantic relationships. Helms joined the First Baptist team in February 2015, subsequently forming two ministries for single adults in the church. The first, Young Professionals, is geared toward connecting adults between the ages of 23 and 35. The other ministry, Single Adults, is aimed toward older generations. With a goal of leading individuals toward Jesus Christ, Helms said, the ministry seeks to connect people between the ages of 35 and 55 who have been divorced, separated or who have never married. 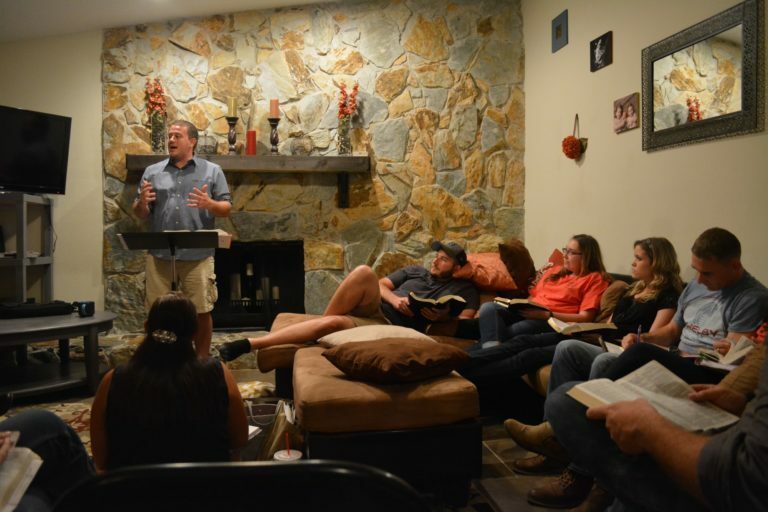 The Single Adults ministry meets Sundays at 9 a.m.
“I thought that we needed to start a home group,” Helms said. He noticed that many of the church’s young adults were active in the church through assisting with childcare or Sunday School, but that they did not have their own group to worship with. Nearly two years later, the Young Professionals ministry has grown to about 25 people. The group meets Sunday nights at the home of Helms and his wife, Audrey. The weekly ministry kicks off with a 40-minute Bible study before breaking apart for games and relationship building. Often, both ministries will combine for trips to theme parks or volunteering. While the members of the Young Professionals group fit the age of online dating users — 27% of 18 to 24-year-olds and 22% of 25 to 34-year-olds used dating apps in 2015, according to Pew Research Center — popular apps like Tinder don’t always take into account a user’s faith, values or goals. Matching with a fellow user is typically based on two users “liking” one another. And while Helms isn’t opposed to members of the ministry using the app, the goal of Young Professionals is to form connections based on common interests and shared faith. In the Young Professionals ministry, Helms added, members know that they’re connecting with people who are likely looking for something similar — friendships or a long-term relationship. Earlier this year, a couple that met through the ministry celebrated their engagement, a first for the club. Members of the club agree that they seek friendship and shared connections, rather than relying on an app to help them connect with people. Lauren Morris, Allison Singleton and Emily Godheim are all members of the ministry. found that she was on the younger side. She later joined Young Professionals. It’s a similar story for other members of the ministry, including Kayla Clenney, 28, and Stephen Taylor, 25. Taylor joined the group in January, after looking for a similar group to join and finding out about Young Professionals through Helms.